place family lifestyle and a solid real estate investment a notch above a “zip lock” on paper liquidity. investor focus with a 32% increase (Gross Dollars --- $22.37M vs. $16.9M). value with 18 sales during each of those periods at nearly identical average PSF’s in excess of $1200. could very well be on the rise. The 2018/2019 Telluride real estate market continues to roll. We are still seeing great values in Mountain Village and the occasional hot deal in the Town of Telluride. The surrounding Mesa's and Ranches saw increased demand and pricing pressure as well. Affordable Housing Proposals see Mixed Results on Election Day. Three issues specifically facing voters in Telluride on Election Day saw mixed results. The hotly debated proposals for a property tax increase for Affordable Housing seem to have passed by the narrowest of margins. Measure 2A, which levies a 2 mil increase on Telluride residential properties seems to have passed by about 32 votes. 2C, which requires voter approval to bond the money collected passed by a slightly larger margin. One affordable housing measure that did not pass was measure 2B, which proposed a sales tax increase and would have likely raised more money for affordable housing than the property tax measure. The Telluride Association of REALTORS® will continue to monitor new developments in the affordable housing discussion and will always be an advocate for housing for all. In addition to the ballot questions regarding affordable housing, a number of different property tax proposals that raised money for specific needs/purposes all received approval from area voters. Voters said yes to property tax hikes requested on this election’s ballots that will help support the fire, school and hospital districts. Each of those measures passed with convincing margins, ensuring that voter approved funding will be in place to compensate for funding shortfalls brought about by declining property tax revenues. The Telluride Fire District won a 2 mil increase and a Gallagher Amendment adjustment that makes up for revenue gaps in lean tax years. The proposal won by a 70-30 margin. The Telluride Hospital District won a similar increase and adjustment by a slightly larger margin. Officials say the revenue will assist with better emergency facilities and better overall service to the public. Finally, the Telluride School District won their question by a slightly smaller 64-36 margin. The $1.2 million in annual revenue the district will receive as a result of the approval of Ballot Issue 4A will be used for attracting and retaining high quality teachers, general operations, programming, and maintaining class sizes. The third time was definitely not a charm for supporters of the creation of a Downtown Improvement District. The third go round at this issue was defeated by a count of 64 supporting and 108 against. The BID funding would have been spent on improvements within the district, including snow removal, more frequent trash pick-up, marketing, way-finding signage and other services. Under the BID plan, downtown was split into two zones. Businesses on Yampa Street and Lincoln Avenue and the side streets between them were in the premium zone. If the BID funding were approved, these businesses would have paid a special frontage assessment of $10.29 per linear foot and a mill levy of 2.22 mills. Nonprofits in the areas of Lincoln and Yampa would only have paid the special assessment and could have applied to waive or reduce what they paid on the special assessment. Nonprofits on Oak Street would not have paid any additional taxes. All other businesses in the district would have been in the standard zone and would only have paid the 2.22 mill levy. It is unclear what will happen moving forward. Colorado Democrats had a huge night on Tuesday, gaining control of all houses of the Colorado General Assembly. Jarod Polis becomes Colorado’s Governor, Democrats held their majority in the House of Representatives, and were able to gain three seats in the Senate to gain a 19-16 advantage. For the Colorado Association of REALTORS®, there were many wins and losses across the state. Groups like CAR are always hoping for a split legislature, which makes it tougher for bad ideas to make it all the way through the legislature. However, CAR remains excited to greet and work with the many new members of the legislature and work with them to insure that housing issues remain high on their lists of priorities. On the ballot measure side, Colorado voters rejected nearly every proposal put in front of them that included tax increases. Both transportation funding measures (Prop 109 and the CAR supported Prop 110) failed to gain approval by similar 40-60 margins of defeat. Amendment 73 (Opposed by CAR) would have significantly raised taxes for education funding was defeated by a 55-45 margin. Proposition 112 was opposed by CAR and would have significantly increased restrictions on the oil and gas industry was also defeated by a 56-44 measure. As is the case in almost every mid-term election in the modern area, the party not in the White House experienced large gains across the country on Election Night. However, the party in the White House actually strengthened its majority in the Senate, a phenomenon that does not usually occur in the midterms. The end result is that the Democrats regained control of the House of Representatives after 10 years of Republican control and the Republicans increased their majority in the Senate. While it’s easy to lament these results as a forbearance of gridlock for the next two years, it's important to remember that balance between the parties isn’t a bad thing. The founding fathers of this country sought balance in the structure of our government and gave us a system to fully debate and vet all ideas before they become law. It might feel like gridlock, but it is actually our country at work making sure bad ideas don’t get fast tracked into law. On October 19, the Treasury Department released proposed rules for Qualified Opportunity Zones, a federal program created by the Tax Cuts and Jobs Act in 2017. The program incentivizes investment and development in distressed communities, designated as “Qualified Opportunity Zones” (QOZs) through tax benefits for investors. These benefits include deferral of federal capital gains tax on qualified capital gains reinvested into a QOZ (via an “Opportunity Fund”), and potential reduction in the tax ultimately paid on those gains (if held for five years they receive a step-up in basis of 10%; if held for seven, 15%). In addition, gains accrued on investments while in an Opportunity Fund and invested into a QOZ may be exempted from federal capital gains tax, if the investments are from a proper deferral election (reinvested capital gains that the tax is deferred on) and held for at least ten years. The proposed rules provide important clarifications for interested investors, including the type of gains eligible for tax deferral (capital only), how investments into Opportunity Funds made of both capital gains proceeds and non-gains funds are treated, the overall timeline for the program, how to certify an Opportunity Fund and meet the “90% asset requirement” (that 90% of a fund’s assets be held in a QOZ), and how they will determine that an Opportunity Fund has “substantially improved” a QOZ business property. Further proposed rules are expected on other aspects of the program, and the IRS will hold a hearing on the issue on January 10, 2019. Many of my clients have inquired with me recently about the options of purchasing an existing home or buying a lot and building a home to their specification. It’s a very interesting question in today’s Telluride real estate market. Please allow me to be clear that I’m talking about residential construction here, not commercial or condominium development. It also needs to be understood that I am talking in generalities and that each project will have unique factors and costs unique to its own. There are incredible home builders in the Telluride market. However, basic supply and demand is dictating an increase in construction costs due to the supply of qualified contractors. Workers are being drawn to Denver and other areas of the Western Slope where conditions and pay may be favorable. There is also a shortage of young people entering the trades. Almost all the materials used for building homes in Telluride are now imported; lumber and steel from Canada are an example where proposed tariffs may increase the costs further. Hard Costs are the actual construction costs and can vary dramatically upon the size of the home and what quality of finishes, lighting and appliances are desired by the owner. These costs also depend on which municipality you choose to build in. In the Town of Telluride there may be workforce mitigation fees and historical preservation impacts. The Town of Mountain Village has very specific architectural guidelines such as a 35% stone requirement which ultimately preserves the overall consistency and property values of the community. If you are looking to build a mountain modern, contemporary home, Mountain Village, or Aldasoro Ranch may be the best options as their design guidelines are now more geared to this style of home. Soft costs are fees for architectural design, engineering, and municipal development fees such as building permits, construction mitigation, water and sewer tap fees. One important tip is to identify your builder early in the process and connect them with your architect to avoid over-designing outside your budget. Some builders and architects already have a great track record and comfort with each other to achieve this. A general range of softs costs is 10% of the project total for architecture and engineering and 15% to 20% of the project cost for development fees. There are currently 86 lots for sale in Mountain Village at an average size of .67 acres at an average price of $1 Million. One item to note is that I have seen recent engineering and architectural designs that work well with steep lots that can provide excellent land value and amazing views. In the Town of Telluride, there are only 17 lots available for sale at an average size of .84 acres and an average price of $1.6 Million. Price is at a premium as the Town of Telluride is rapidly approaching build out. Other options for vacant land two surrounding sub-divisions that provide amazing access, privacy and value. In Aldasoro Ranch, there are 16 lots available for sale at an average size of 3.3 acres and average price of $787K. A general range for total new construction costs are $700 to $850 sq/ft plus the cost of the land. In today’s market the cost of new construction may be similar to the cost of purchasing an existing home. The question to ask is if the owner is willing to invest time in the process and then be OK with an up to 18-month construction timeline once municipal approvals are granted. The benefits of new construction are to design and enjoy a home of your dreams and there may greater appreciation potential for newer homes. Please contact me for more information on vacant land and home construction. The Telluride real estate market continues to hold great potential for investment, rental income, personal enjoyment and asset appreciation. The Condo segment in the Town of Telluride is seeing the greatest demand for listings and inventory and is thus enjoying the highest rate of pricing growth. The best values and available inventory currently exist in Mountain Village and the nearby mesas. Please contact me for more market information and specific property questions. The Telluride real estate market continues to hold strong 11 months into the year with dollar volume and number of transactions at a 6-year record high. $547.5M in contracts closed through November, and sales are up 35%. The number of sales are up 13% compared to those through November of 2016. TREC is pleased that its transactions have exceeded that of the market up 38% over those through November of 2016. Mountain Village continues to see a steady number of high-end luxury homes and condos trading hands. This year has seen twelve sales over $4M in Mountain Village. Overall, Mountain Village single-family home and condo/townhome sales are nearly twice that relative to sales through Q3 ‘16. Despite the limited inventory, properties in the Town of Telluride are still trading briskly, with the number of sales up 32% over the third quarter of 2016. This year has seen eight sales over $4M in the Town of Telluride. Nearing a close to the final quarter of the year, the Telluride real estate market outlook is positive. 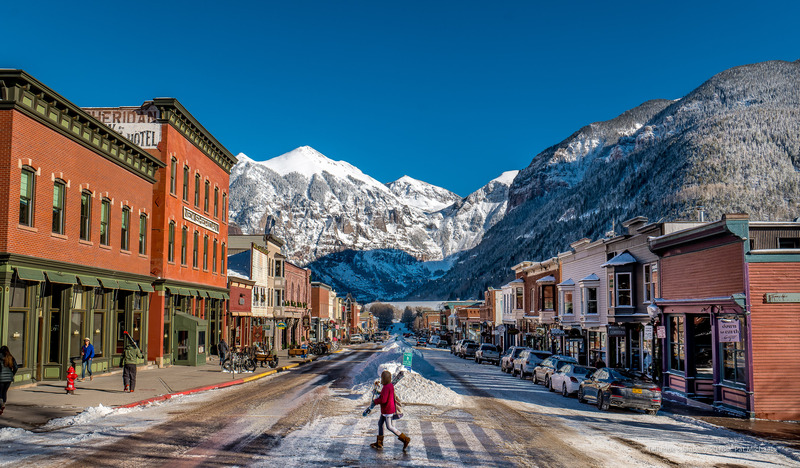 October and November saw four $5.0M+ Town of Telluride home sales, four $2.7M+ Mountain Village condo/townhome sales, and a $5.15M Mountain Village home sale. With $83.7M in sales currently under contract according to the MLS, we look forward to December's sales results.